The so-called evidence of extraterrestrial has been here for many decades. 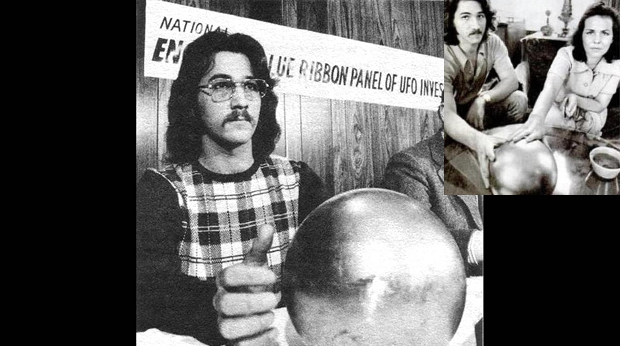 One of them happened to be the Betz sphere that was found in 1974. Experts conducted several tests of the sphere, and they concluded it as a magnetic object sensitive to magnetic fields, mechanical stimulation, and many sound emissions. They found out that it could stand a pressure of 120,000 pounds per square inch, making them conclude that the thing was composed of stainless steel, particularly magnetic ferrous alloy #431. While many theories have been proposed, experts have never been fully explained the Betz Sphere or Betz Orb. Some suggested that it may be an extraterrestrial object because of the peculiar characteristic behind the artifact. Medical student Terry Mathew Betz discovered the sphere after a massive fire had destroyed a large portion of a forest near his Jacksonville home in Florida. The mysterious object, which measured around 20 centimeters in diameter, was in excellent condition with a triangle depicted on its surface. The Betz family initially thought it was the remains of military equipment or satellite. However, no impact was found in the surrounding or any signs of damage, just a massive fire. The family reportedly noticed the metallic sphere appeared to react to some musical notes. Not only that, they apparently also observed their family dog acting strangely. Many attributed the dog’s behavior to the high-frequency wave from the sphere, which was beyond human hearing range. As if those two strange happenings weren’t enough, the family reported that the orb changed direction on its own if placed on the floor and pushed. The weird thing was that it returned to the starting point after pushing it on the floor. Photographer Lou Egner of the Jacksonville Journal went to the place of Betz family to check the strange thing. According to Lou, when he put the sphere on the floor it rolled away and stopped. Moments later, it turned and went to the right by itself around four feet. It then stopped, turned again, rolled to the left approximately eight feet, formed a big arc and came right to Lou’s feet. Moreover, a strange sound reportedly heard from inside the sphere. A reporter from the Tampa Bay Times confirmed all of these statements. Interestingly, it appeared that the media was not the only group interested in the mysterious sphere. The NASA and the U.S. Navy had allegedly shown interest in the sphere. The family initially refused to give the sphere to the Navy but changed their mind after experiencing various weird phenomena surrounding the sphere. A spokesman for the U.S. Navy Chris Berninger said their first x-ray attempts failed to determine metal components and they were planning to use a more powerful machine and run spectrograph on it. Further test revealed that the shell of the sphere was about half an inch thick and it was able to withstand a pressure of 120,000 pounds per square inch. Experts concluded that it was composed of magnetic ferrous alloy #431, a kind of stainless steel. They also found out that the alloy’s corrosion resistance was ideal for marine and aircraft applications. Civil and Hydraulic Engineering professor Dr. James Albert Harder also showed interest in the strange sphere. He discovered that the two internal spheres were composed of elements far heavier than anything known to science. He asserted that drilling into the sphere would create an explosion like an atomic bomb. Dr. Carl Williston of Omega Minus One Institution in Louisiana also conducted several tests to the so-called ball from space. He found out that it had three magnetic poles and a possible fourth. Dr. Williston stated that the flux density of the magnetic field seemed to vary in strength base in an unknown pattern. An x-ray revealed that there were three similar spheroid shapes within the ball. Oddly, these shapes had some kind of a halo surrounding them. The metal was the same to stainless steel but with some unknown content. Experts concluded that this unknown ball was a magnetic sphere sensitive to mechanical stimulation, various sound emissions, and magnetic fields. It might be in a damaged state if it was an extraterrestrial probe.